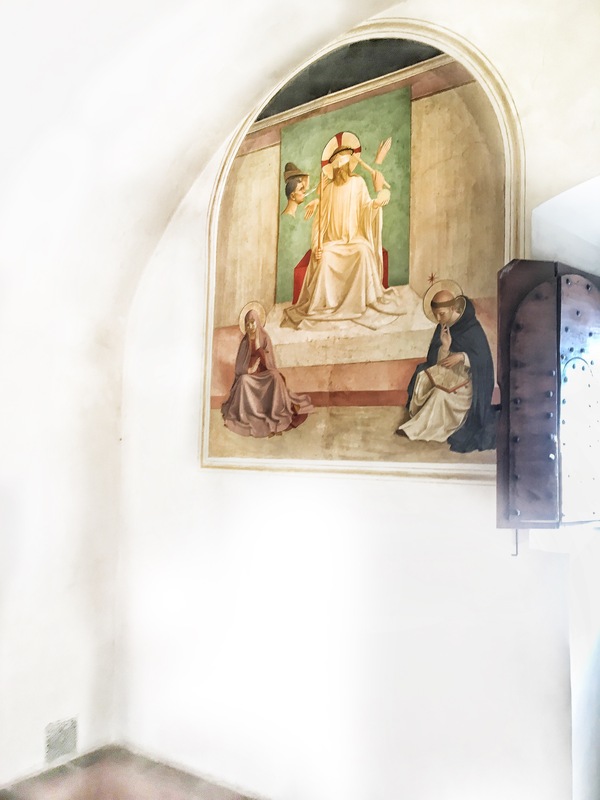 Frescos, Fra Angelico, and Friars. | In Florence. A Firenze. Frescos, Fra Angelico, and Friars. 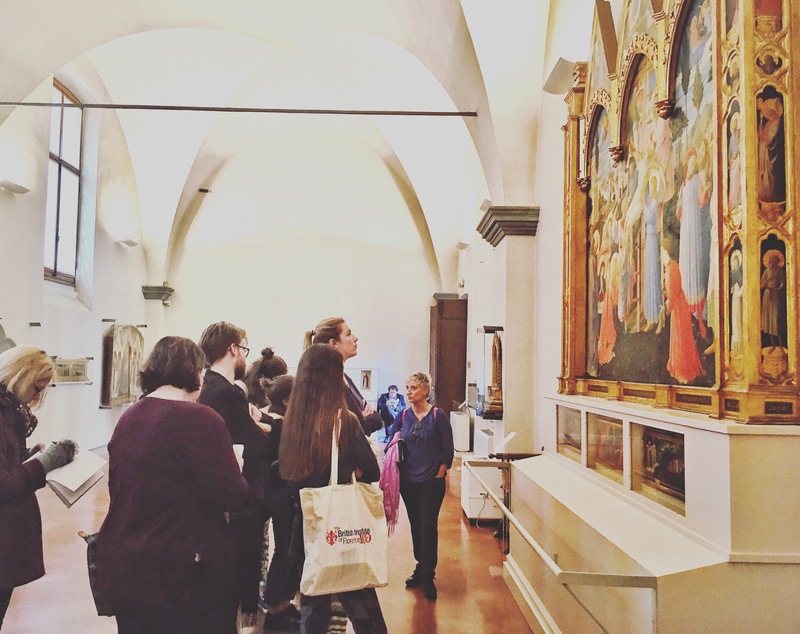 A few times a week, the History of Art students at The British Institute of Florence go on site visits. From time to time I join them, to capture their trips with my camera. I was incredibly excited when I realised I’d be accompanying the students on a visit to the Convent of San Marco. 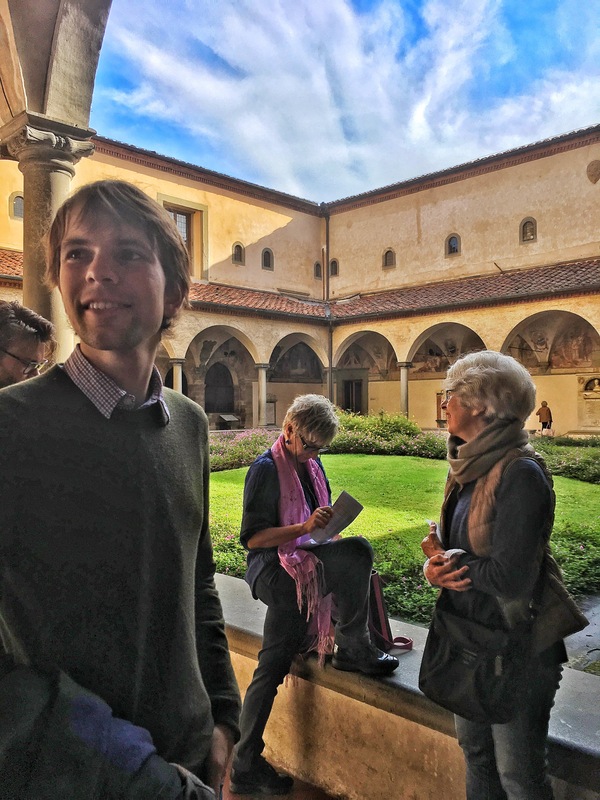 Last December I visited the elegant cloisters, the frescoed cells, and the truly beautiful library. For some reason the place really stuck with me, so much so, that it actually inspired the whole of my dissertation. To get the chance to go back, and to have someone who really knows their stuff lead us round, was an opportunity I couldn’t pass up. Early Saturday morning, we met our lovely lecturer for the day, outside in the glorious sunshine. After taking a quick role call, she began by heading into the church. You really do get the full hour and a half. 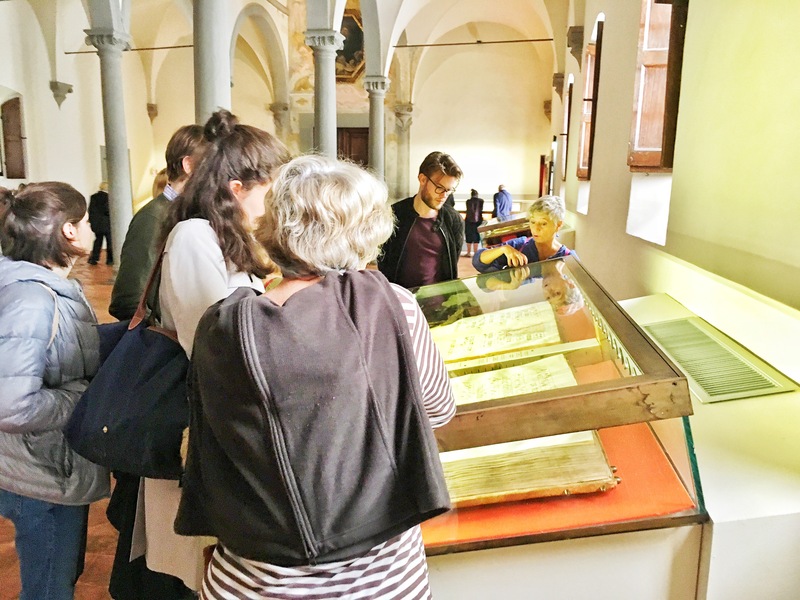 As we got into the church, everyone settled down on the wooden pews, whilst our teacher talked us through the history, architecture, art and role of the church in Florentine history. To break up the deeper intellectual stuff, our teacher led us to the back of the church to show us the mummified body of St. Antoninus, which lies in a glass coffin. You’d never think most of us were around 20, because we all turned into a bunch of giggling school kids. 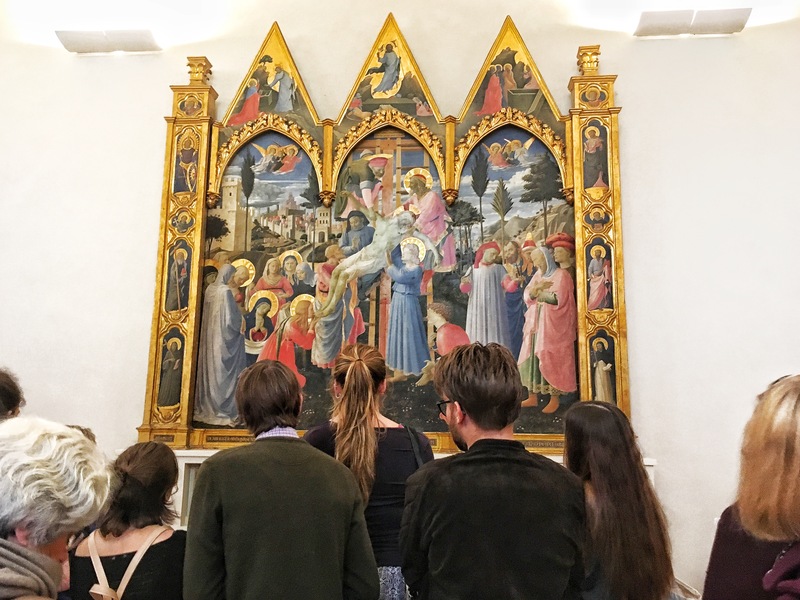 Once we’d settled down, we moved onto through the frescoed cloisters, into the room filled with works by the likes of Fra Angelico. He is one of my favourites, and there is something so magical about the scenes he paints. Our teacher took us through a selected few of these pieces, talking in detail about the history, symbolism and techniques used in each. Next, we headed upstairs. This part of the convent is so interesting. There are halls lined with cells that the friars used for prayer and reflection, and in each is a fresco, done mostly by Fra Angelico. These cells entertained (in the most religious sense) the likes of Savonarola, Cosimo il Vecchio de’ Medici, who had his own cell, Archbishop St Antoninus, and the Blessed Fra Angelico. Architecturally this space is beautiful, but it also has an incredibly peaceful atmosphere, which even our large group couldn’t disrupt. This is where our talk ended, but hopefully I’ve shown you how much is fitted into each visit. Without a doubt, this is my favourite part of the internship. I mean, I’m a little biased towards the trips given that I love all things arty, old and historical, but they are fantastic in their own right. Every lecturer brings something new to the experience, with how they talk, gesture, or engage with the students. There is one thing they all have in common though: enthusiasm. And boy this is infectious. I’ve spent so many hours sat in lecture halls, listening to professors talk about things I am actually interested in, but I can’t recall half of it. This all changes when you can visualise what you’re talking about. When you can walk in the footsteps of those artists, or friars in this case, that the lecturer is describing. Also, I think fresh air always makes things click better into place. Standard lectures are just as fab, but it’s always good to mix things up from time-to-time.